Boxed Britains Soldiers ROAN Set 2090 Royal Irish Fusiliers, At Attention, No. A Britains lead figure set no. 2090 depicting the Royal Irish Fusiliers, at attention, No. 1 dress, from the Regiments Of All Nations collection. The set comprises of eight uniformed soldiers at attention. The figures come in their original Regiments Of All Nations box with inner card mount and paper label. The box has been restrung. The figures measure approximately 5.5cm (2 ¼ inches) high each. The box measures 37.5cm (14 ¾ inches) by 9cm (3 ½ inches) by 3cm (1 ¼ inches). The set in box weighs 250g. The figures are all in a very good condition with no damage and only the odd bit of wear to some (but not all) of the figures paintwork. The box is in sound condition but has some scuffs, marks and a bit of a crumpled corner. The label is a bit dirty. For further details and condition see pictures below... 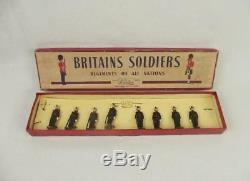 The item "Boxed Britains Soldiers ROAN Set 2090 Royal Irish Fusiliers, At Attention, No. 1" is in sale since Thursday, October 26, 2017. This item is in the category "Toys & Games\Toy Soldiers\Britains". The seller is "theantiquesstorehouse" and is located in Portsmouth, Hampshire.